To celebrate the release of Saving Mr. Banks, the untold story behind Mary Poppins, we have copies of P.L. 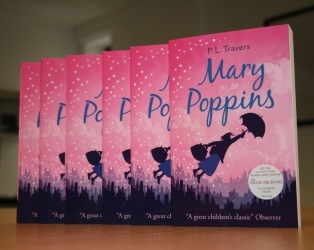 Travers’ book to give away – an enchanting read for adults and children alike. To win a copy, just answer the question below before midday on Friday, December 6th 2013. Saving Mr. Banks is now showing at the IFI. Also, if you’re in need of a spoonful of sugar, or you’re simply feeling Supercalifragilisticexpialidocious, we will have screenings of Mary Poppins on December 8th and 9th. To win a copy, just answer the question below before midday on Monday, December 2nd 2013.
Who played the role of Mary Poppins in the 1964 film?